Mausoleum of the Samanids, Ismail Samani, The oldest monument in Central Asia, Sights of Uzbekistan, sights of Bukhara. 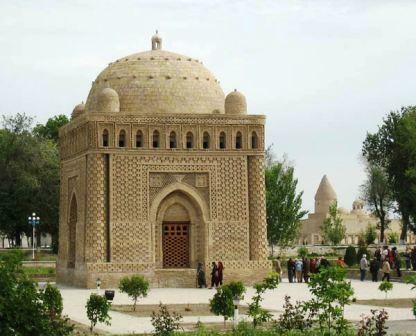 Mausoleum of the Samanids is one of the architectural masterpieces in Central Asia, it is situated in the historical centre of Bukhara, was built in 9th century (between 892 and 943 years) by the great ruler Ismail Samani who captured Bukhara in 874 and became founder of the Samanid state. Later Ismail Samani and his grandson were buried in the mausoleum. According to the legend, the beauty of the building impressed the Mongols so much, that they could not break it but they buried the whole city. Samanids mausoleum is one of the buildings, which are known from the time of the Sassanids, it follows that the Samanids Mausoleum is associated with pre – Arab traditions, as evidenced by the many elements of architectural decoration. The building was built of burnt bricks; the length of the lateral wall is 10metre. The most amazing in the design of the building is how an architect managed to combine a small number of different building elements. Unusual patterns on the walls, catching the light, create the impression of light and shadow, which causes a magical effect. In spite of the Samanid Mausoleum is the oldest monument in Central Asia, it is well preserved and remains one of the main attractions of Bukhara.